Acquired: Signed as a free agent on July 4, 2016. Contract extended on Jan. 24, 2019. 2018: In 18 games (17 starts), Adjei had 22 catches for 214 yards and one touchdown. He also had 17 total tackles and one fumble recovery. 2017: In 18 games, Adjei led the team with 15 special teams tackles and one fumble recovery. Adjei appeared in the West Semi-Final and West Final. 2016: Spent training camp with the Eskimos. Signed to the practice roster in Week 3. Activated in Week 5 and played in 11 games (one start), recording six receptions for 53 yards. He also added five special teams tackles. Went on the practice roster in Week 8. Activated in Week 12. In the Eastern Semi-Final against Hamilton he recorded two special teams tackles and in the Eastern Final against Ottawa he recorded three special teams tackles. 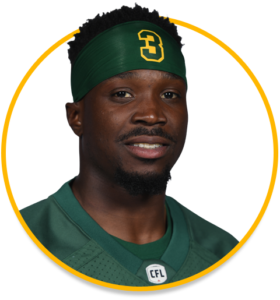 2015: (Toronto) In 16 games, Adjei recorded seven receptions for 63 yards and one touchdown. He also added two tackles. He scored his first career CFL touchdown on July 24, 2015 against BC on a five-yard reception. 2014: (Toronto) In 16 games, Adjei recorded seven receptions for 61 yards and added one special teams tackle. 2013: Adjei was selected in the CFL Draft by the Toronto Argonauts. He played out his eligibility at the University of Buffalo. College: Adjei began his college career at City College of San Francisco (2010-11) where he won the Northern California Championship in 2010 and was a finalist in 2011. He then transferred to the University of Buffalo (NCAA) where he played two seasons (2012-13) dressing in nine total games.